Place the cubed butter, caster sugar, and pears on to an oven proof tray. Give it all a good mix around with your hands and then bake for around 15 minutes, until the pears start to brown slightly. For a better result make sure you baste the pears with the sugary butter mixture during the cooking period, this gives an even colour. Be careful though as this will be hot! Remove the tray from the oven and set to one side to cool slightly. While the pears are cooling, make the dressing; Either in mixing bowl or in a food processor, mix together the vinegar, mustard and runny honey until combined then slowly mix in the walnut oil, check the seasoning and set to one side. 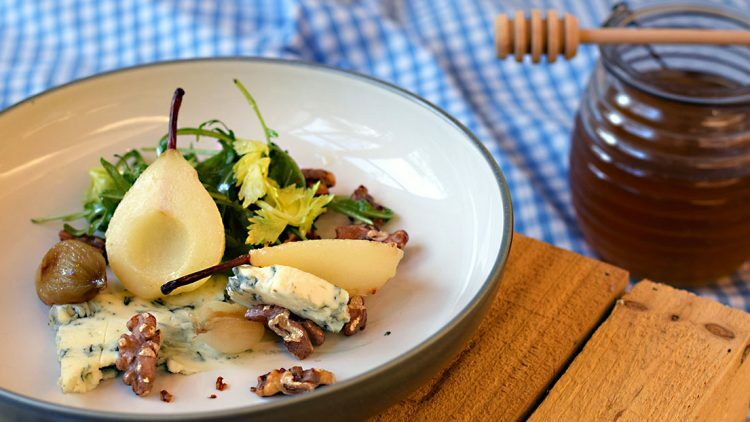 Place your warm, roasted pear on good flat serving dish, lay over slices of the gorgonzola, and scatter over the roasted walnuts and rocket. Drizzle over the dressing, a good pinch of sea salt and serve.